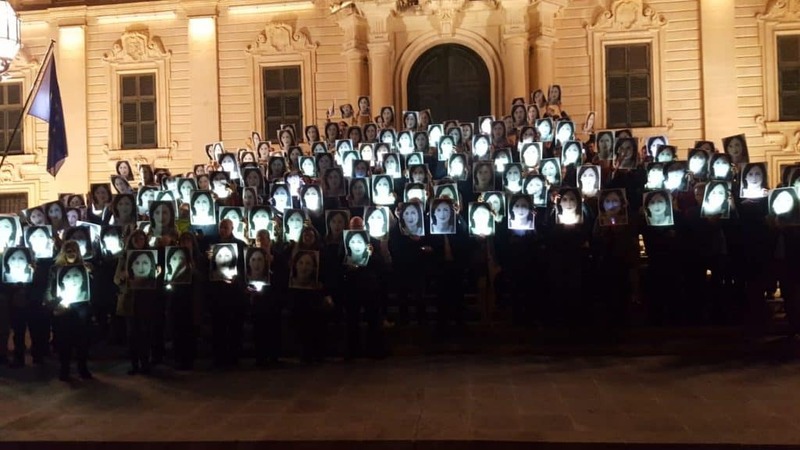 Castille Square was a sea of activists holding up portraits of Daphne Caruana Galizia, to mark eighteen months since the journalist’s brutal assassination, an action reminiscent of the scene from the movie Being John Malkovich. #occupyjustice activists pointed their fingers at the Prime Minister, reminding him that in a year and a half since the assassination, the nation was still in the dark as to who commissioned her murder. “We stand together in Daphne’s name to ensure that you do not sweep away her life, her work, and her murder, along with the candles and flowers that you dispose of daily,” they said. The activists once more reiterated their eighteen-month-old plea for an independent inquiry. “We are disgusted at the way the Prime Minister is leaving EVERY stone unturned to find the mastermind behind Daphne’s murder,” they said. “You can discredit all the international media reports, but facts are facts, Prime Minister: your closest aides are rotten to the core and you keep on protecting them. If your soul still has a crumb of a conscience left, then shoulder your political responsibility now,” they said.